Week 11 was fun, Oklahoma State came within a missed extra point or converted two point conversion of beating Oklahoma and then Texas Tech raced back from a 34-17 deficit to force a game-winning drive from Texas. I don’t think either Texas or Oklahoma are really capable of losing to this Kansas team but I guess we’ll see. The Texas team that lost to Kansas two years ago had a woozy Shane Buechele, they inserted Ty Swoopes and immediately turned the ball over a few times, and they ran D’Onta Foreman like 50x when he had already worn all the tread off his tires in previous 30-carry weeks. I also don’t think Kansas State is going to beat Iowa State, the Wildcats just don’t have enough offense to get points on the board in that game and Hakeem Butler will probably beast mode them a few times. So that means the big games are Texas-Iowa State, Oklahoma State-West Virginia, and then finally Oklahoma-West Virginia. 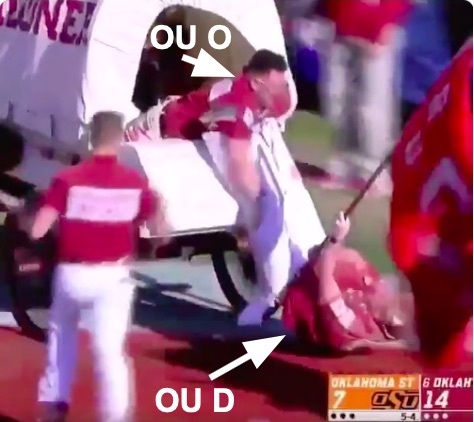 I broke this one down at Inside Texas this week, complete with some diagrams of Iowa State’s de-facto “triple option” when pump fake Purdy is running RPOs as well as a breakdown of one of the trap-2 blitzes they used to sack Charlie Brewer. I was intrigued and impressed when they used the three-deep/two-under zone blitz against Iowa earlier this year but their two-deep/four-under zone blitzes have really been where it’s at for them this season. This year there’s only room for one bash bro team in the final and there may not be room for either as both need a little help from the outcomes of the other games. I think I like Texas in this game, playing at home with Sam Ehlinger as good as he’s been, but Iowa State may have a more complete team. Also, a RRS rematch would be fun but so would an OU-ISU rematch. From there a Texas-WV rematch would be the third most interesting outcome in my estimation and OU-WV replaying their battle a week later would be the worst case scenario from an entertainment perspective. This is a tricky finishing stretch for West Virginia, to end the season with back to backs against the Oklahoma schools that are generally amongst the league’s best. OSU hasn’t been great this year but they can score points and they’ve flashed on defense from time to time. I think West Virginia will struggle with the OSU balance as well as Tylan Wallace’s ability to execute double moves against off coverage. Taylor Cornelius vs Kenny Robinson will be an interesting matchup in this game that could determine the outcome. On the other side of the ball, OSU is at their best when Malcolm Rodriguez and/or Kenneth Edison-McGruder can get involved in stopping the run. They need to do work outside at CB so they can play more single-high or sky coverage to get those guys clamping down on the middle of the field. The story for OSU next year is also that, can they improve enough at CB to free up their safeties to be more aggressive? Also they are getting wiped out across the DL by graduation and their current DL class for 2019 is all HS kids, that’ll be a story as well. Everyone will zero in on QB, I’m sure, that’ll probably work out just fine with that Wallace fellow running around. I think I like Oklahoma State to pull this one out. They still have a lot to play for, namely bowl eligibility, and they should be playing with a lot of confidence given how the last few weeks have gone since they came off the bye week. That end of the year game could very well be exactly that, a semi-final for the Big 12 title. Oklahoma’s defense has predictably remained terrible since Ruffin McNeil took over, mainly because they have bad players and are playing good teams. I think that detail could be hard for OU fans to accept given the service rankings on these Sooners but them’s the facts. The DBs don’t know how to find the ball, lots of guys don’t know how to tackle, many aren’t developed physically enough to hold the point of attack consistently over the game, and guys like Caleb Kelly have never learned the game properly. The question is whether the Schooner (offense) can continue to drag the flag waiver (defense) past another high scoring opponent on the road? I’m thinking the answer is no and that West Virginia will beat them at home. The Mountaineers are very good at creating the matchups they like out wide, running David Sills V on slot fades or from wherever he needs to be on the field to get the right matchup, and OU simply can’t cover this team without playing nickel and dropping everyone back. Then the question is, can they stop the run from that look? Obviously West Virginia has issues in this game as well, they have to stop the Oklahoma offense enough to pull out the win. Current forecasts don’t suggest that the weather should be too bad but it’s definitely going to be a hostile atmosphere and a colder game for the finessin Sooners and their beat-up wideout Marquise Brown. That’s also going to make for a tough battle for the Mountaineers in tackling Trey Sermon over and over again, or just chasing Kyler Murray around which is a chore unlike most others. The Mountaineers can’t just take jabs and hooks from Oklahoma in the corner over the course of a game, no one in this league can, but they have a lot of speed up front that could potentially allow them to limit some of the damage from OU’s attack. They’re also good at closing on the ball from deep and bringing some nasty, overwhelming pressures. Lincoln Riley and Kyler Murray vs Tony Gibson and the Hillbillies in the crowd is probably the key matchup here. I think West Virginia can pull this out, but then again they’ve never done it since they joined the league. This is a legacy-making game for Kyler Murray, this and the B12 final if they advance to that game. Some interesting videos from a former player are out that accuse Bill Snyder of employing some archaic and extremely strict/questionable practices in order to fashion his teams into the units we saw on Saturdays. In particular, holding out rent checks for guys that didn’t observe team rules. I’ve been waiting for something like this for the last decade, Snyder has always been an obviously old fashioned, authoritarian head coach and I’ve always been suspicious of whether his ideas of appropriate discipline matched modern sentiments on the matter. The PI600 drills make a lot of sense of his defenses’ insistence and strange ability to play without a lot of substitutions. This is the kind of stuff that stays bottled up while a coach is winning and in charge and that really starts to slip out once a team is losing and the wagons don’t stay in a tight circle. You can tell that the writers, particularly the subscription-based recruiting writers, are very ready to be done with the Snyder era. It’s not been terribly good for their business because of his approach to recruiting and it’s particularly bad when they don’t win. It seems very likely that Snyder will step aside after this season, there’s obviously a lot of momentum working against him and their record this year has been very poor. As for his replacement, I think a defensive coach from the Missouri Valley conference that I happen to be very familiar with is a likely hire. There’s also rumors floating around that THE Dallas Cowboys may make a move to hire Lincoln Riley from the Sooners. The reasons would be that he’s a cutting edge offensive mind in an era where the NFL is finally embracing the college spread offense. There’s also the possibility that this is just smoke that Riley will leverage with the Oklahoma admin for money and control back in Norman. The big question is what Riley wants from his career. If he’s interested in the NFL, he should probably go for this as the opportunity may not exist in the future and it’d be very easy for him to rebound from an NFL flop to land another top job in the college scene. Nick Saban and Jim Harbaugh went from NFL struggles to coaching at Alabama and Michigan respectively, both of which are comparable to Oklahoma in terms of the best jobs in college ball. If I were an NFL franchise executive I’d be very hesitant about hiring Riley as a HC. I think his offensive mind could translate very, very well to the NFL but I’d have questions about his ability to run an overall NFL program and I’d want significant input on who filled out his staff. In turn that could make Riley hesitant about going the NFL route when he could always use the threat of leaving to wield increasingly greater control back at OU over that CEO president they have that seems to have a different idea of who should be in charge. Finally, it sounds like Les Miles is going to Kansas because some big money booster there thinks that’s what’s best for their program. Personally I don’t think that’s a great idea but it’ll be interesting to see what Miles thinks is the best recruiting strategy for the Jayhawks. The best Mark Mangino teams were built largely from Kansas recruits. The plan to get David Beaty and recruit DFW and eventually Louisiana hard was a bust. The Iowa State plan to get Matt Campbell and hit the Midwest in addition to Texas, Florida, and California has yielded a boom. You have to recruit some infrastructure roster pieces that will fight for the tradition and glory of the local program. Obviously Kansas doesn’t have a great tradition but kids from the region will care if they have to go home and live in the region forever after playing for more 1-11 football teams. Well, you were right about WVU last week. I sure hope you’re right about tonight too. The WVU defense has played a lot better at home this, although some of that has to do with the competition. If the crowd is really a difference maker, I can sorta squint and see the possibility of a win. WVU is really low on healthy bodies though. Shoulda had it, Willy couldn’t handle the pressure of keeping pace with Kyler Murray.